Most who know me are aware that I'm a political junkie. That means I'm often wanting to watch Meet the Press (or whatever) when someone else in the house would rather see a rerun of Glee or the DVR of Ellen. Or anything. Catching part of last night's State of the Union address by POTUS and the accompanying flood of interpretation, assessment, response, spin, and commentary could keep a guy busy for days. Mark Penn said POTUS came up short. Howard Fineman said it was like the 70's song "Love Train." Regardless of your political leanings, there is a review and interpretation that suits you. That got me thinking: What if principals regularly gave the same kind of address? Perhaps the dog days of January and February would be a good time. I wonder what messages they would try to convey? Would we sound the alarm that we're failing? Or point to the things that are right with our system? Avoiding a Teacher: Great Motivation? I've had quite a few discussions over the years with parents, armchair coaches (and real ones), and other people about motivation, and specifically how fear and avoidance are or are not effective motivators. And it seems everyone has a different opinion on whether motivation from something like fear or avoidance is a good or bad thing. At the beginning of the year, my sixth grader announced that he was going to work like crazy so he could have the opportunity to take a test the district uses to make placements in a seventh grade core subject area. I didn't think much of it at the time, because, well, he's a sixth grader and thus says lots of things. Earlier this week, he crowed that the teacher told him he had indeed qualified for the test. He would be placed in one of the more advanced classes. The only remaining question was which one. Mission accomplished (though we refrained from hanging a banner). The Boz: 25 years Ahead of His Time? I was a kid in the 1980s watching a ton of college sports on tv. Oklahoma football seemed unstoppable. I attended an Iowa State vs. Oklahoma game in Ames once. Though I don't remember the score, I can say with certainty that the Sooner Schooner was on the field way more than the inept Cyclone offense. 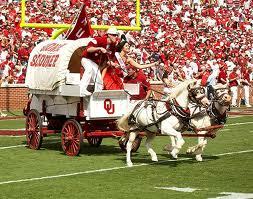 Even today, I can name the Boomer Sooner Fight Song in four notes because I heard it so many times that day. I remember OU's Brian Bosworth strutting around t-shirt that read "National Communists Against Athletes" at the '87 Orange Bowl. On one hand, I couldn't stop watching the guy. On the other, I was not the kind of high school athlete who was going to upset convention or create a ruckus. Maybe that's why I was so drawn to watching to see what The Boz was going to do next.